Serta Redbud - . . .
Serta Sycamore . . .
Serta Willow - . 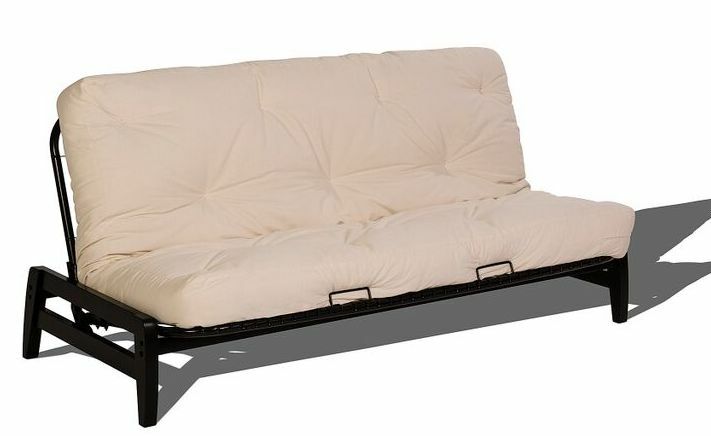 . .
- The Serta Paris Futon frame features stylish minimalist hardwood arms in a black finish and a sturdy metal body. You can order just the frame or add a Serta futon mattress and a futon cover to complete your set. Please Note: Mattress sold separately. Assembly required. - The Perfect Rest hinge system gives the you the option of 4 different reclined positions - allowing the Paris futon frame incredible comfort and utility. You can choose from four different positions: bed, couch, and two different reclined positions. - The Open-Clicking mechanism that is built into the frame allows for easy adjustment; you can change futon positions using just one hand!  Perfect Rest Four-Hinge Reclining System.  Open-click mechanism for easy adjustment.  Slim Black finish solid Hardwood arm-rests.  Wire-Mesh deck for durability and comfort.  Easy assembly with instructions included.  One year manufacturer warranty. Serta futon frames are shipped out directly from the manufacturer in 2-5 business days. To Determine Your Shipping Cost: Please place the item(s) into your cart, then enter your state and zip code and click on the "apply" button. The shipping cost will be added to your total. The Serta Paris Frame comes with an 1 year manufacturer's warranty against defects in materials and workmanship. This warranty applies to NON commercial use only and NORMAL wear and tear. Money back on all returns notified within 7 days of delivery receipt. Buyer pays for all shipping costs. Item(s) must be in unused condition and returned in their original packaging. Return authorization is required. Returned items subject to 20% restocking fee.